Who else is excited for Halloween? I've said this about a billion times but I am so happy Halloween is tomorrow. If you want me on Tuesday I'll be happily handing out candy and then sitting down to watch the Bake Off final. This week's picks are from John Lewis, H&M Home and Paperchase. 1. Eddingtons Halloween Pumpkins Drinks Dispenser £35.00 [x] : Now this is something I'd want at my Halloween party! Is there a better way to serve Halloween drinks? I don't think so. 2. 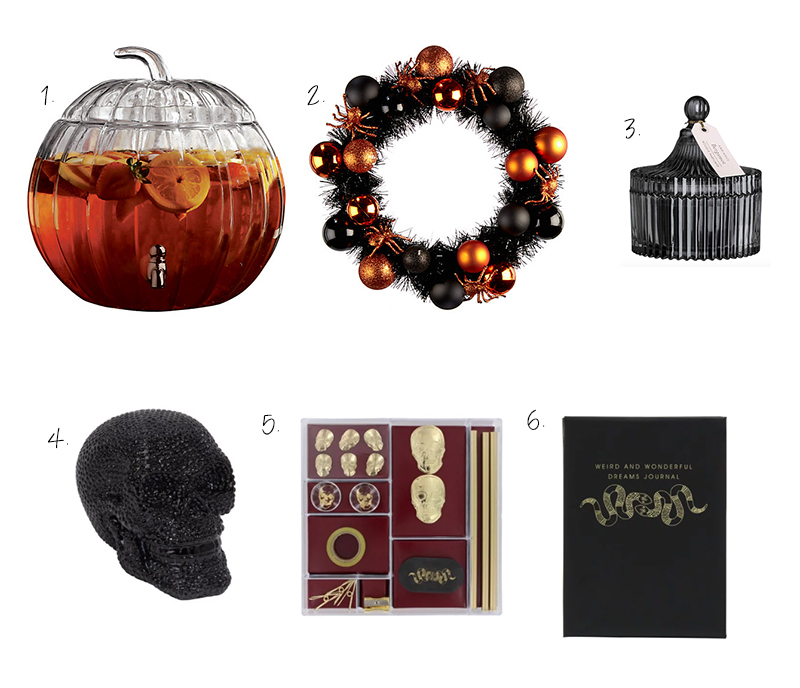 John Lewis Halloween Black and Orange Wreath £18.00 [x] : How beautiful is this Halloween wreath? So gorgeous! 3. Scented Candle in Glass Holder £12.99 [x] : Who can say no to a candle with a bit of a spooky feel. This is perfect for bringing a bit of that eery Halloween feel into your home. 4. Bloom Noir Skull Money Box £12.00 [x] : Not the most subtle thing in this week's edit, but perfect for anyone who loves something super spooky. 5. Bloom Noir Stationery Set £10.00 [x] : I am in love with this spooky stationery set! Need, need, need. 6. Bloom Noir Dreams Journal £12.00 [x] : This spooky journal allows you to record your dreams and look back at them later. Perfect for anyone who has incredibly vivid dreams.